He is the shiftless leader of Odd Jobs Gin, with a high blood sugar level due to his enormous sweet tooth. His true identity is the samurai once feared as the "White Demon" during the Joi war, but nowadays he only uses wooden sword. He drives a scooter. The second person to join Gintoki's business, she is a young alien girl who belongs to the Yato Clan, one of the strongest and most bloodthirsty of the Amanto races. She came to Earth to earn big money, but instead gets caught into a Yakuza business where she worked as a bodyguard virtually for free. She encounters Gintoki when she finally decides to run away, and ends up joining Odd Job Gin until she saves enough money to go home. Despite her cute looks, her comments are often very harsh. He is from a samurai family that runs a dojo, only it is nearly closed down due to his father's death and the recent law to abandon all swords. Before meeting Gintoki, he worked at a restaurant, but he couldn't even manage a cash register. 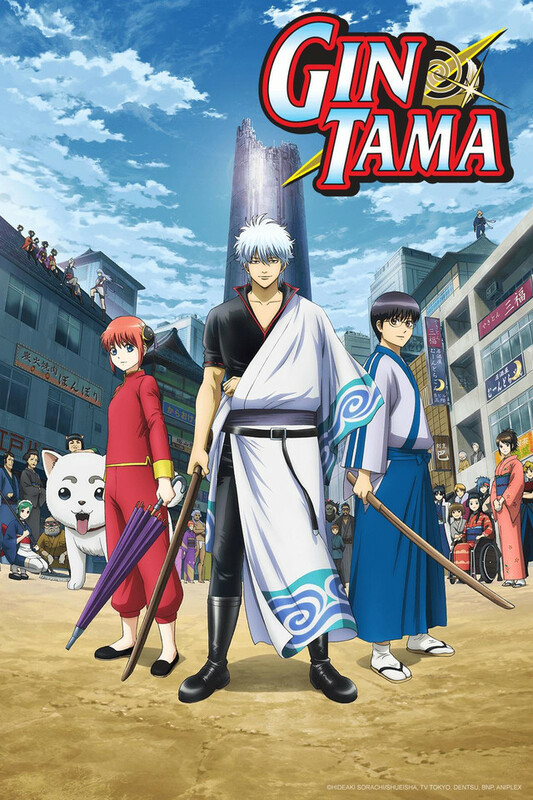 After Gintoki saved his sister from a loan shark, he decides to work for Odd Job Gin, in order to learn Gintoki's samurai spirit, but he soon regrets his decision. He is also the leader of Otsu's official fan club, an idol singer gaining much popularity recently. She is a former elite kunoichi from the Oniwabanshuu, who now lives as an assassin targeting corrupt merchants et cetera. As a clumsy kunoichi, she often loses her glasses, which leaves her almost blind. Her infatuation with Gintoki is responded by his apparent annoyance, but this response seems to further inflame her masochistic nature. She often incorporates her favorite food natto and sado-masochism into her fighting. A mysterious extraterrestrial creature left to Katsura by his former comrade, Tatsuma Sakamoto. Although she lacks expressions and is hard to tell what she is thinking, she seems to care about Katsura, as she often appears to help Katsura at the times of his crisis. She uses signboards to communicate, as well as an occasional means of attack. Sometimes human arms and hairy legs are seen inside her "outfit". He is the commander of the Shinsengumi. His nickname is "Gorilla". He is a good-natured and honorable person, and although he is not popular with women at all, the members of the Shinsengumi are fiercely loyal to him. Due to his recklessly straight forward nature, his love and actions toward Tae are nothing but those of a stalker. Gintoki's former comrade during the Joi war, he is a wanted man due to his involvement in terrorist activities against the Bakufu. Naturally he often runs away from Bakufu and the Shinsengumi, and seen in many forms of disguises. His nickname is "Zura", which means a toupee. He sometimes works odd jobs to raise money for his terrorist activities. The owner of "Snack Otose" and also Gintoki's landlady, who is constantly arguing with Gintoki about his rent. However, she is a very generous person, as she forgave Catherine from stealing her money. Although she has aged quite a bit, she once was very pretty and was Kabuki district's idol. He is known as the stupid prince who collects monsters and aliens as his pets. They cause havoc in Edo every time Prince Hata brings them along, but he never seems to learn from his mistakes. His antenna-like object stuck on his head is his charm point, but it often gets cut off. An abandoned Inugami who is collected by Kagura. With his massive strength and size, he often puts his masters in danger. His real strength is awakened by consuming strawberry and milk. He is the vice commander of the Shinsengumi. He has been known to smother anything he eats under a mountain of mayonnaise. Although he is being feared as the "demonic vice commander" for his blunt exterior and belligerent attitude, he has a tendency to cry after watching movies that are not particularly emotional.